When the plant closes, the Navajo people will suffer. When Indian Country’s largest coal-fired power plant shuts down, the Navajo Nation will sacrifice hundreds of jobs and millions of dollars in revenues after decades of sacrificing its land, water, air, health and lives to provide energy to the residents of Arizona, California and Nevada. On Monday, after nearly five years of negotiations, the Navajo Nation Council voted to keep the Navajo Generating Station (NGS) open until 2019, saving approximately 700 jobs and preventing a loss of nearly $30 million per year in revenues until the end of the decade. 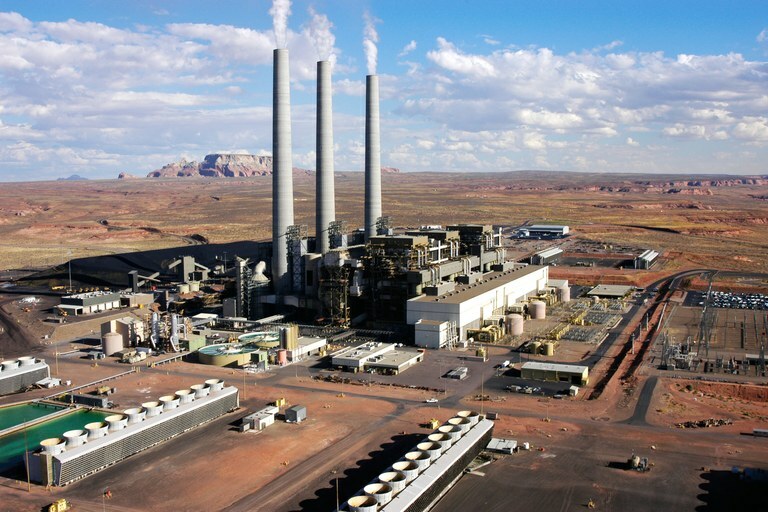 The Navajo Generating Station, a coal power plant on the Navajo Nation, sends power to Arizona, California and Nevada. The plant will cease production by 2019. The plant’s operator, Salt River Project (SRP), says natural gas is cleaner and cheaper. For the Navajo Nation, the loss of NGS will trigger a sudden and traumatic bow out from the coal industry while reinforcing a relationship based on exploitation and colonialism. To SRP and the states of Arizona, California and Nevada, the Navajo Nation is simply a resource that can be used and discarded. In 2009, SRP approached the Navajo Nation to renew their lease and extend the life of NGS until 2044. A deal was struck, and in 2013, the Navajo council passed the agreement after a grueling six months of debate, special sessions, workshops and other expenditures of time and money. However, SRP never signed the lease, and many Navajos found out when the utility announced that it would decommission the plant by 2019 – a complete reversal of its previous position and clear indication of how little concern the company had for its hosts. When SRP announced that it would cease operations by the end of the year, it sent the entire Navajo Council scrambling to keep the plant from closing. To avoid the catastrophic shock to the Nation’s annual budget, and the sudden layoff of hundreds of workers, the Council passed a “replacement lease” which will keep the plant running until 2019 and delay its dismantlement until 2022. While it has become clear that SRP representatives are untrustworthy when negotiating contracts, their behavior is nothing new. When the federal government and Arizona first approached the Navajo Nation fifty years ago in the hope of moving water from the Colorado River to Phoenix, Navajo interests were secondary to non-Native ranchers, agribusinesses and corporations. The federal government paid for expensive and complicated water projects that helped Phoenix grow and made NGS possible; and from the flooded farm fields of the Salt River Valley to the real estate market that replaced it, Phoenix grew first with water, and continues to grow with cheap energy – all outsourced by the Navajo Nation. There is no water infrastructure on the reservation, and in many parts of Navajo territory, electricity is scarce. Despite the name, there is little that is “Navajo” about NGS. The Nation has almost no control over its fate and the plant fails to reflect Navajo culture or values. However, closing the plant provides little justice for the Nation – environmental or otherwise. Instead, closing NGS becomes yet another example of placing Indigenous people into hardship for the benefit of non-Natives. While NGS took root on the Navajo Nation, its main benefactors have always been non-Native businesses and families in the Southwest. When it closes, only the Navajo Nation will suffer. In the 1960’s, the Navajo Nation’s first attorney, Norman Little, persuaded the council to support hydroelectric dams with the aim of providing water and power to the city of Phoenix. However, when those dams became politically contentious, the Department of Interior and regional utility operators, including SRP, abandoned the projects and settled on building a coal-fired power plant instead. By the late 1960’s, members of the Navajo Tribal Council hoped to develop coal resources in the belief that nuclear power would eventually make coal obsolete. The council never envisioned a permanent coal economy: they saw coal as an initial step toward a more diversified economy. The Navajo Nation agreed to build NGS and over the years, council members have followed the coal agenda as it if were their own. Fifty years later, the Nation has become dependent. Today, the same outside forces that took water from the Navajo Nation while simultaneously introducing a coal economy are at work again. That force is resource colonialism: the purchase of raw goods on reservation lands under unfavorable conditions at a fraction of their eventual wealth. But as coal becomes less profitable for SRP, the Navajo reservation is left to figure out what to do next, now that big business has no more use for the Nation. Navajo and non-Native environmental groups have urged lawmakers to reject the “replacement” lease and have demanded the immediate closure of NGS. They have also called for a transition from coal to renewable energy technologies. However, this would be a terrible shock to the Navajo Nation budget and for hundreds of workers at the plant and the Kayenta coal mine, which feeds NGS. If the Navajo Nation simply replaced coal with sustainable alternatives, decades from now the reservation could find itself in yet another boom and bust cycle of energy production while remaining the most marginal and exploited actor in the commodity chain. Or perhaps the Navajo Nation might embrace solar and coal simultaneously, continuing dependency and failing to reduce carbon emissions. Even now, Navajo lawmakers are thinking about ways to keep the coal economy from collapsing completely. The only option is to buy all of the industry’s discarded infrastructure, such as rail and transmission lines, and perhaps NGS itself, for tens of millions of dollars in the hope it might turn a profit. The underlying problem is not what kind of energy is produced but the terms under which it is produced. The problem is the Navajo Nation’s relationship to resource colonialism, whether that’s wind, solar or coal, and Navajo leaders must resolve this structural inequality. Those exploiting the Nation for its resources certainly won’t. There are alternatives to coal, but there are also alternatives to an energy economy built on resource exploitation. We need to start talking about alternatives to development, not just alternative development. Until the Navajo Nation begins moving away from an economy built on colonialism, our nation will continue to suffer job losses, economic crises, and underemployment while non-Native communities continue to prosper. Andrew Curley is a citizen of the Navajo Nation, political commentator and a postdoc research fellow at the University of North Carolina Chapel Hill.